Red Bull denied ad made health claims. A Red Bull poster that promotes the annual 4pm Finish Day has been banned by the Advertising Standards Authority. The ad watchdog upheld complaints that the execution, which was created in-house, implied Red Bull had a beneficial effect on health, and focus and concentration in particular. 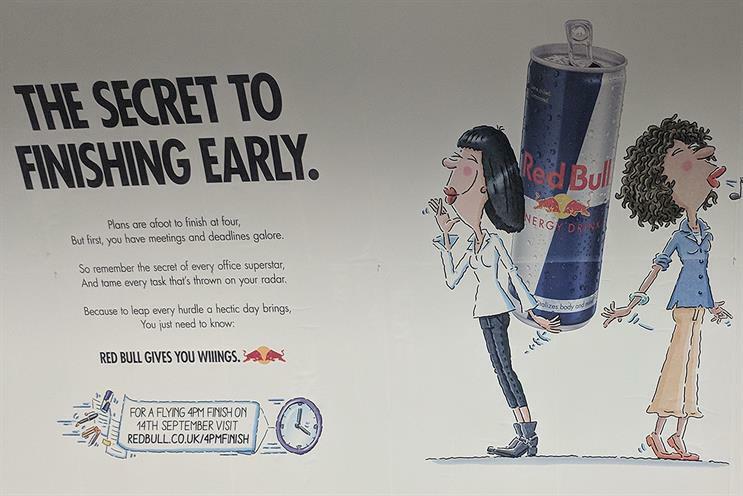 The work, which ran on the London Underground, featured a cartoon of two women smiling and whistling in front of a can of Red Bull. It stated: "The secret to finishing early. Plans are afoot to finish at four, But first, you have meetings and deadlines galore. So remember the secret of every office superstar, And tame every task that’s thrown on your radar. Because to leap every hurdle a hectic day brings, You just need to know: Red Bull gives you wiiings." Red Bull argued that the ad, which promoted a consumer initiative, was "not to suggest, either directly or implicitly, that consumption of Red Bull would help achieve certain goals". The energy-drink brand said: "The text did not suggest their drink delivered a health benefit, made people better at doing their job through increased concentration or focus, or had any health benefit at all." However, the ASA upheld the complaints because the picture of the Red Bull can paired with a relatable scenario of being overwhelmed at work and the penultimate line of the poem suggested a relationship between the drink and health. The body said: "Consumers would understand that the ad implied a relationship between a food and health, specifically that Red Bull could help increase mental focus, concentration and energy levels." It ruled that the poster must not appear again in its current form.